It sounds too good to be true. An industry where the salary has grown 28 percent since 2000 and continues to increase each year. An industry where the average salary is around $73,000 for long-haul and $40,000 for local driving. So why is it that the trucking industry has a shortage of drivers and 50,000 driver positions available? Trucking companies need to act fast, or this number will continue to spiral out of control. Here are a few thoughts on how employers can attract better drivers with driver availability being a top concern. 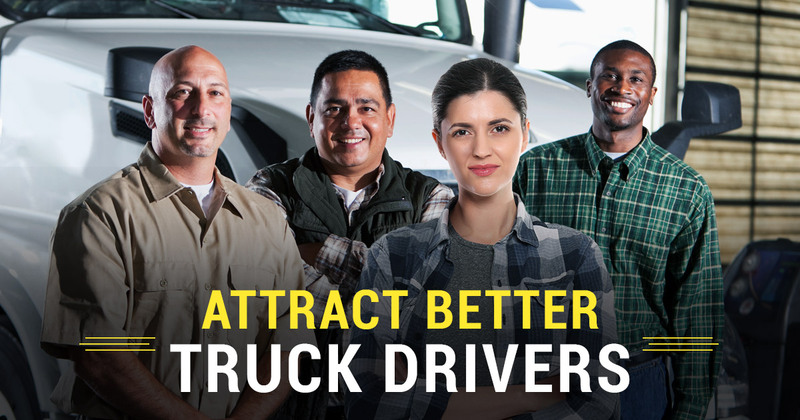 The average trucking company spends a few thousand dollars a year on recruiting advertising. Even some of the major nationwide firms spend drastically less than businesses in other industries who generate the same amount of annual revenue and profits. The money trucking companies invest is typically payments for placing job openings online or in industry publications. It’s time to start marketing trucking careers to the younger generation, with targeted efforts designed to highlight the perks of a career as a truck driver. Marketing should also focus more on the qualifications a driver must have. Currently, only about 8% of applicants meet the minimum requirements for the job. Last but certainly not least, trucking companies must start to focus on their untapped demographic of ladies. Currently, only 6% of truckers are women, making this an impressive area of opportunity. Begin looking through the eyes of the people you want to hire and you will find opportunities to attract those candidates. The shortage of home time is a major industry deterrent. The attractive salaries pique a lot of interest, but the modern driver is about family and wants more time at home. Additional home time will also go a long way in attracting more women to the field. This means curating more early morning and daytime routes for local driving, longer blocks of time at home for long-distance drivers—and more weekends with family for everyone. To make this happen, it’s time to invest in small regional supply chain facilities, working with suppliers to fine-tune shipping lanes, and turning to advanced routing technology to keep things on track. The bottom line: if you want to attract better drivers, offer them a better quality of life.